The Bergamo bus is operated by ATB bus network which provides a regular service that links passengers arriving at the airport to the town of Bergamo itself. 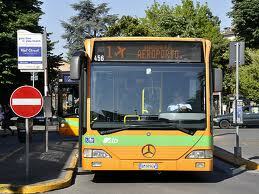 The bus, is bus number 1 and it runs from outside Bergamo airport to Bergamo train station situated in Piazza Marconi. It then proceeds to the lower town, then onto the Funicolar station and then up to the upper town ‘Città Alta’. The number 1 bus does stop close by several of the hotels in Bergamo such as The Best Western and San Marco. The buses do not have seperate luggage compartment and passengers are required to carry their luggage on the bus. Sometimes the buses do get a little crowded and if you have a lot of luggage, it can be a little awkward. Passengers wishing to catch the bus from Bergamo back to the airport should allow themselves plenty of time. You can catch the bus from outside Bergamo train station, The Best Western hotel, Largo Colle Aperto and the Funicular station. It is always advisable to ask the driver if the bus stops at the airport, as some of them don’t! The buses that run to the airport from Bergamo usually have a picture of a plane or have the word Aeroporto displayed on the front of the bus. The bus runs every 30 minutes from 6am – midnight (at the time of writing) and passengers need to buy a ticket before boarding the bus. You can buy a ticket at one of the kiosks at the airport or one of the machines. If you want to buy a tickets in Bergamo, tickets can also be purchased from Bergamo train station, a couple of newsagents and the ATB office in Largo Porta Nuova. The price of the tickets are 2 euros (at the time of writing). you have inserted your ticket, the machine will validate your ticket by printing a time and date on your ticket. The journey from the airport to the town of Bergamo is approximately 10-15 minutes depending on traffic and once you have validated your bus ticket, you generally have 90 minutes before it expires. If your ticket is still valid, you can stay on the bus right up to the upper town. There are several tickets you can buy for the buses around Bergamo and it obviously depends on how long you intend staying in Bergamo. There are the single tickets to which we discussed above and there are tickets that are valid for longer periods such as 3 days. These tickets, allow you unlimited travel on all ATB buses, the Funicolar and Bergamo airport bus. The Bergamo bus is a very cheap and efficient way of getting to and from the airport and also around the city itself.